the Egwuatu gang headed to the museum district last week for some Children's Museum Houston fun! i was actually there with Chiso back in May for his 1st grade class field trip, but he wanted Dego and Kosi to join in on the fun too, so off we went. as soon as we got checked in, the very last showing of Power Up, a mini stage play put on by Express Children's Theater, was about to start. right on time! the hostess invited us in and Mr. Blue Robot Guy stayed in charater and directed us into the theater in his robot voice. we piled into the theater and waited in anticipation for the show to start. got a quick photo with the amazing cast afterwards! i was SO impressed by those talented kiddos! i'm definitely no actress and struggle to remember even my grocery list but if acting is their passion, they are in the game at an early age and well on their way to perfecting their craft. i just knew the kids were ready to attack and explore the museum exhibits after the show, but all it took was one, "mama, I'm hungry!" for me to head us on over to the Fresh Cafe first. i for one had coached clients and worked out earlier that morning so i was definitely ready to eat something healthy and filling. 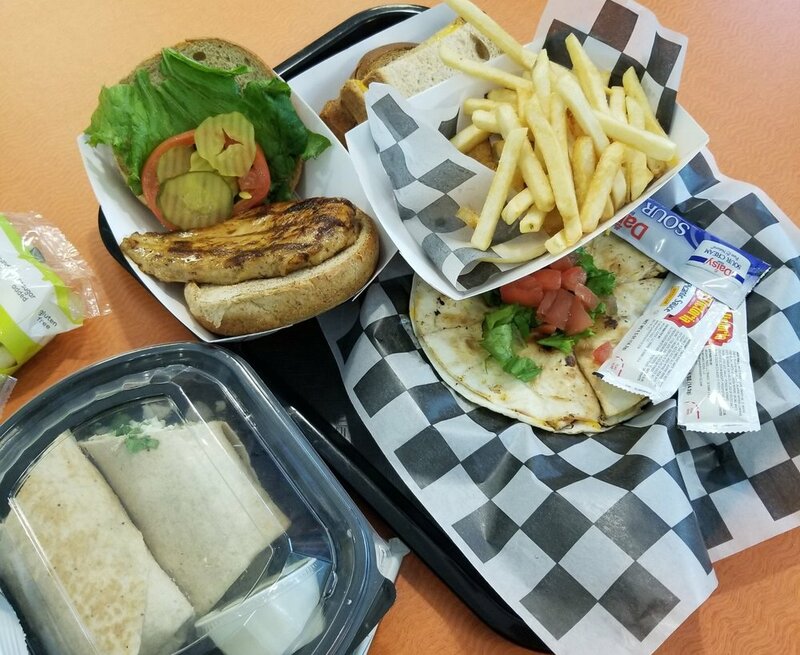 i enjoyed the yummy chicken quinoa wrap, a made-to-order grilled chicken sandwich on wheat (ya know, for later) the kids had grilled cheese sandwiches, fries, apple slices, and Sonny enjoyed the chicken quesadilla. for dessert? "...the best ice cream in the country!". my childhood has Blue Bell written all over it. time to burn off all this energy! making and flying paper planes with papa. a city for kids, run by kids. you can even download Kidtropolis games to play at home! my very first job was a grocery store cashier and i loved it. i actually couldn't forget produce codes if i tried. slow it down, Koko! vroom, vroom! "no one is you and that is your super power!" make sure your little ones know just how unique and special they are. God makes no mistakes. they need to know that no amount of Likes will ever be able to determine just how amazing and worthwhile they are. the boys did arts and crafts in the main hallway before we finally headed out for good! they were so done and played out at this point. this picture was definitely a force cause nobody wanted to raise their hands with me and the statues. lol. Instagram, Facebook, & Twitter! check out their site for ticket and exhibit info and enjoy your visit!